Today, we are celebrating what a San Antonio man has done for history as an original Tuskegee Airman. SAN ANTONIO — A San Antonio man is preparing to celebrate his 95th birthday next month. 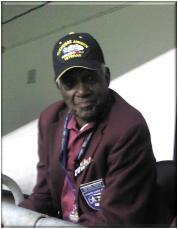 Today, we are celebrating what he has done for history as an original Tuskegee Airman. Theodore Johnson has had a lot of good times. For nearly a century his stories have been bringing laughter to people of all ages and backgrounds. When asked how many children he has, Johnson said none with a straight face. “My wife had them all,” he said with a smile. He has nine kids. Before that, he was making history. He is humble despite helping shape the fabric of our country. At the February meeting of SACTAI, Johnson shared stories from his time in the military. The national TAI organization started in the ’70s to encourage teens to get involved in the democratic process and highlight the aviation or aerospace career fields. They also preserve the accomplishments of the original Tuskegee Airmen. “We want to make sure that their legacy is around as far as long as possible,” said Sinkfield. Johnson has a lot of accomplishments. He traveled between military bases in the 1940s. In 1944 he arrived at Omaha Beach and made his way through Europe. Johnson shares that ride with others in the form of life anecdotes laced with laughter.